Racing stripes don’t make everything go faster, but they can make them look cooler. The 17-inch MSI GE73VR 7RF Raider Pro ($1,949 to start, $2.399 as tested) has a fresh design that stands out. It also packs some powerful speakers, and, thanks to a GTX 1070 GPU with 8GB of VRAM, smooth frame rates for intensive games at high settings. 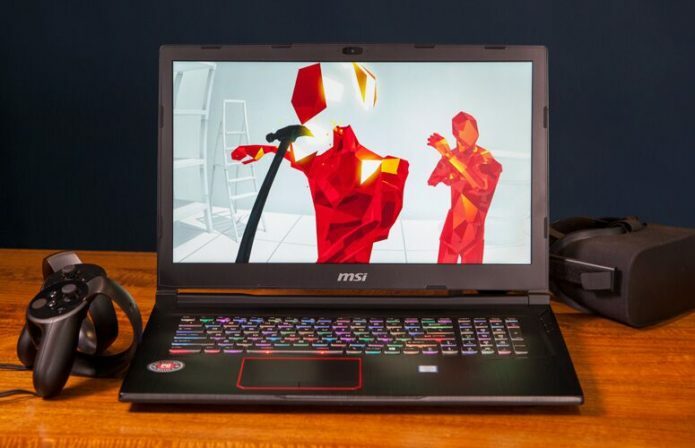 What brings the Raider Pro down are its dimmer-than-average display and its keyboard and mouse, which aren’t up to par with other gaming laptops. I really like that MSI’s doing something a little different with the Raider. It’s still the black and red that shouts “look at me, I play games!” but there are a few new flourishes on the machine that I find refreshing. The lid is faux-brushed aluminum, but instead of being totally flat, it has a small hump where the silver MSI logo and red dragon shield are more pronounced. On each side of the hump are red, angular patterns.